Barring any last minute changes, Nigeria’s Standard Chartered Bank Plc will name Mrs. Bola Adesola, a former Executive Director of First Bank Plc as its Managing Director/Chief Executive Officer. Mrs. Adesola was a former Executive Director, Corporate Banking at First Bank of Nigeria Plc before she resigned her appointment alongside two other Executive Directors (ED) in July 2010. A seasoned financial services expert, Mrs. Adesola had been Managing Director/Chief Executive of Kakawa Discount House Limited, a company she successfully repositioned from an essentially mono-product profile into a multi product enterprise. She spent nine years in Citibank Nigeria (Nigeria International Bank, a member of Citigroup). 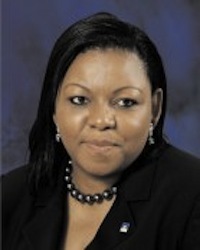 She was also part of the start-up team for Citibank, Tanzania, Dar es Salaam where she served as pioneer Treasurer. Called to the Nigerian Bar in 1985, Bola holds a law degree from the University of Buckingham, UK and has attended numerous industry-related and personal development courses in Nigeria and overseas. She is also an honorary member of the Chartered Institute of Bankers, Nigeria. Who said that women can't have it all?